Many’s the time I have sat with a schoolboy, scrubbing brush and soap-and-water whilst said pupil removed his mark from a school desk. So: it is doubly puzzling to me how one of the top schools in the country – the world, even – has allowed itself to become covered in the graffiti of the great and the good. Eton College: a whole village, essentially; great chapel, domed library, concert hall, music school. It looks like a tiny university, a little piece of Oxford or Cambridge, torn at the dotted line and parked across the Thames from Windsor. Its beginnings are ancient. Henry VI needed lots of people to pray for his safe passage into the next life. In those days rich people used their power to purchase Godspeed. So in 1440 he founded the King’s College of Our Lady of Eton besides Wyndsor. It consisted of 70 poor scholars, each of whom would spend their schooldays there before going on to study at King’s College, Cambridge, which was built by Henry the following year. I hope the scholars did a good job of praying for Henry, for he died in the Tower of London , either of melancholy or murder, depending on who you believe, around 30 years later. It was small and free for a good while: records from the seventeenth century show 198 pupils; but in the eighteenth century posh pupils arrived, backed by fat fees and private tutors. It did not improve the conditions of the boarding houses- the places the boys lived in small communities within the schools: they could be dingy and rats were constant companions. But all this time, they boys were carving their names on the walls. Nobody seems to have stopped them: the carved names are prolific. They are everywhere, on pillars, on walls, in the wood. Institutionalised graffiti. In a place which looks like a tiny piece of Hampton Court, but is, of course, still a school for clever, boisterous, privileged boys. Thing is, the carving’s quite good. It must have taken some considerable time. I can’t imagine just whittling away in a contraband few minutes in between the patrols of the master-on-watch. Some of these look like little Tarquin has hired a mason and smuggled him in. Perhaps they have invisibility cloaks at Eton. Whatever their origin the names are a positive delight. 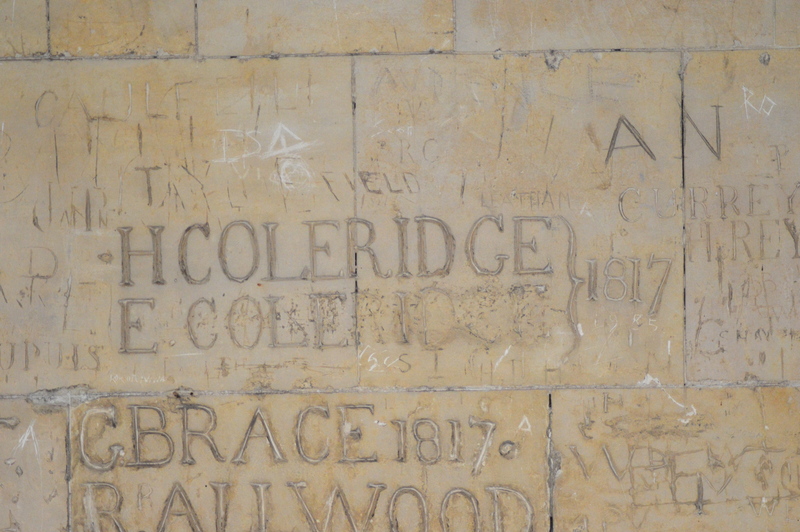 Some are familiar: the two Coleridge boys who set their names in stone on the Cloister Walls; Pitt, Turner, Hobbs. And others just have that music of a school register: Monson, Langford, Marsh, Haigh, Allwood, Lamplugh and Fielding, Barbar and Lawrence. It is, quite simply, a delight to collect them and read them out loud, a lilting litany of English names. 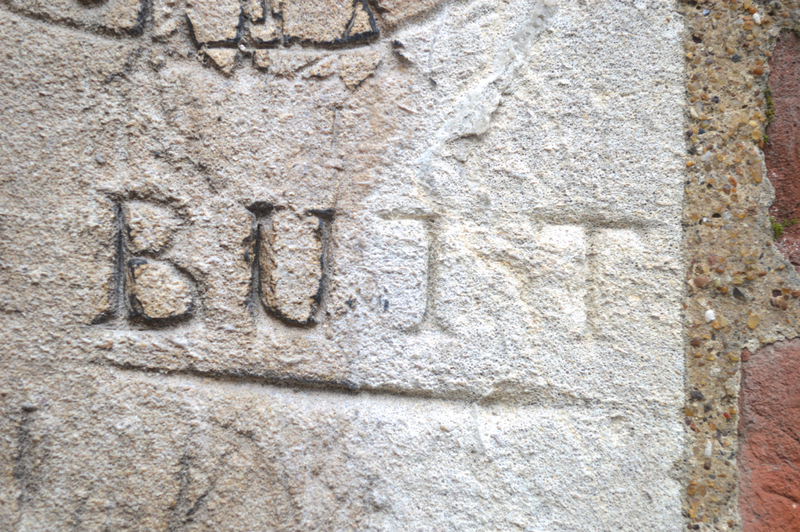 It is just possible that there are some who should have thought twice about carving their name for posteriors. I mean posterity. Posted in UncategorizedTagged Britain, england, Eton College, history, school, travelBookmark the permalink. Ah, so the other public schools don’t allow the same practice, then? Really interesting! Never knew that! Nor did I, till I stepped over the threshold yesterday, Stephanie. It’s an incredible feeling standing in front of these jumbled cascades of pure history. How interesting that the quality of the carving is that regular and even. Can only be professionals. Maybe there is a secret family of stonemasons loving on the premises? That is one of my favourite sketches of all time. My favourites are Undermanager and Zob. many many years ago there was a rather horrorfying film called Unman, Wittering and Zigo. I seem to be the only person I know who ever saw it, yet it has a wikipedia entry. The three were at the end of rollcall because of their names, but they also were comrades in rather shady stuff. Since then I always end anyroll call by thinking the three names. It is really quite a lot of carving, isn’t it? But what is it that drives us to make our mark? To write our names on walls, carve them in trees, on desks? I’d love to hear an explanation of the psychology behind it. As for Rowan Atkinson, one of the best comedy experiences of my life was watching him do that litany of names live during his show about 30 years ago! Ah! An original Atkinson appreciator! I was never cool enough to be in the audience. But I followed his every word. Amazing the amount of work that went into some of those carvings. I have been thinking about this, PT: every school has its art stars, and I would not be at all surprised if the young artists of each generation of Etonians were deployed in stunts like this. Wow. I must put that on my list of things to see, Solveig. Institutionalized graffiti at its best! So this is where they made their mark before making their mark? They should have had some masters with good canes stopping the ones who were not going to be famous from defacing the property! Open it up to poor kids! While not Eton, my 5th, who was also my 6th, grade teacher allowed us to carve our names on one desk. Only one desk, mind you, but, one she had saved from the trash heap and let us carve our names in it. Of course, it was a public school and the desk was a mere dust on the doors and walls of Eton, but, still . .. I can simply imagine the imaginations of the the carvings all these centuries – and of reading them still. What a fun posting.